Electrical appliances consume energy. If an appliance is marked 50 W, it means that if it runs for an hour, it consumes 50 Watt-hour of energy or 50 x 60 x 60 Joules of energy or 180,000 J (Joules is measured in seconds). A typical AAA Alkaline long-life battery produces 5071 Joules of energy. A typical AAA Zinc-Carbon battery produces around 1268 J in its lifetime. The best inverter batteries produce around 7,776,000 J of energy. These numbers are calculated under optimum conditions. Thus, in real life, an appliance consumes more energy, while a battery produces less energy. You may often wonder how many batteries you would require to spend one night relying on them as your only source of power. This question presents a tricky problem. The capacity of a battery in terms of energy has to be determined. The answer also depends on determining which appliances we generally run at night, the length of time for which they run and which battery we should consider, since size and quality is being considered. To get a general idea we must consider the conditions as perfect and the battery as the best available since considering other smaller batteries would produce ridiculous numbers. The latter is calculable, but unrealistic in its implications. Thus for a period of 10 hours they will consume = 250 x 10 x 60 x 60 J =9,000,000. This calculation is not considering requiring an adapter or transformer to increase the working potential or voltage of the batteries. This also is non-inclusive of the potential drop or internal resistance of any of the equipment’s. If all factors are considered two whole batteries might be required with constant supervision (very little sleep!) to power you up for the night. Of course only these machines will run. To be absolutely sure that you never run out of power, we recommend keeping 4 batteries at hand. 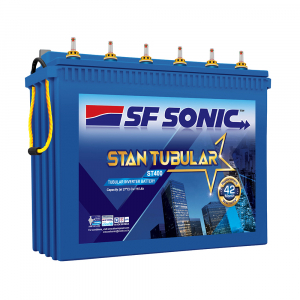 SF Sonic provides the best quality batteries which have in-built detectors that signal when a battery needs to be recharged or the electrolyte needs to be changed. The engineering is done in such a way with a thick hybrid-alloy grid system that even when near-depletion, SF sonic batteries continue to give you sufficient power to keep things bright. They are easy to recharge and charge-up quickly. Compared to other batteries, you can use them night after night after recharging and they will continue to give you the same excellent performance as their superior technology allows them to revive quickly after a deep discharge. Their rugged design also allows to them to withstand extreme heat and thus makes them perfect for your emergency power needs.